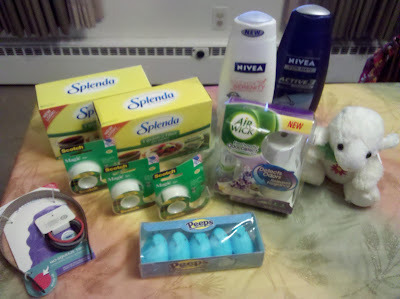 I don't often shop at Walgreens, but after looking at the weekly deals, they seemed to have a lot more freebies this week than Rite Aid (though I am still an avid Rite Aid shopper)! When I do go to Walgreens, I always make sure to bring my Walgreens coupon policy with me, as the cashiers and even managers tend to be less knowledgeable and friendly to couponers. Here's what I got for $3.71 out of pocket (including sales tax)! After the $3 in RR, this was a $.69 moneymaker. I decided to "use up" my Register Rewards instead of rolling them, as in the consistent drugstore game, since I don't shop at Walgreens on a weekly basis. To use these scenarios and print your own coupons, check out Money Saving Mom for the deal match ups!